So predicting when Winds of Winter is going to be released is about as productive as trying to wish unicorns into existence. But with GRRM claiming to have rededicated himself to the book and new pages appearing from recent public appearances, it’s time to talk about wild and mostly unfounded speculation about A Song of Ice and Fire, in a futile attempt to figure out when and if the series will continue. First up is a report that states that Winds of Winter will be the last book in the series and that GRRM will retire after its release. Now neither report is overflowing with information that rises above the level of gossip. They for the most part feed into fears that grew in volume with the delay of Winds of Winter. Namely that GRRM is not getting any younger and that the show would spoil ASOIAF. I personally don’t think anything happened in season 6 that GRRM was not aware of and approved of. But I also understand that he signed a contract and GOT is going to tell the story they were going to tell, the situation they are in is not their fault. The rumors are interesting, but nothing that I feel confident buying into. 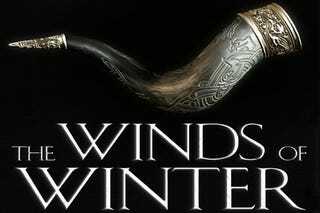 At the other end of the spectrum are reports that not only is Winds of Winter not the last book in the series, but that the series is going to grow beyond the 7 books that have been scheduled. Another report is speculating that GRRM may have a big announcement at MidAmericon II in mid-August. This is mostly baseless(sense a pattern? ), but all the reports pointing towards a January 2017 release date makes this appearance a prime spot to announce something if there is something to announce. For me the interesting part of this is not the possible release date, which is the 1,975th release date for Winds of Winter, but the conflicting reports about the future of the series. Could GRRM wrap up the series in WoW? I don’t see how, but stranger things have happened. If ASOIAF does have a future, I’m leaning towards it going beyond 7 books because there is just so much to cover. I expect MidAmericon to pass without anything beyond a new chapter or two at best, but it was fun engaging in pointless speculation. Early Ghostbusters Reviews are in! The Greatest Movie Ever!!! !